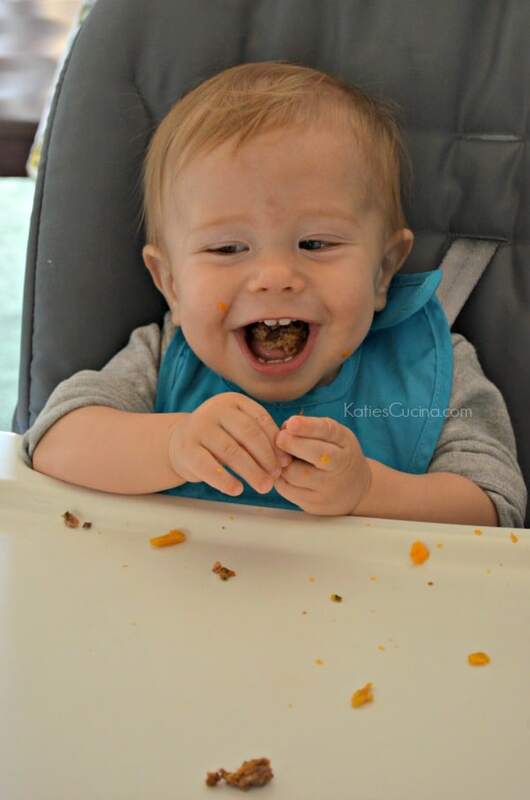 A few months ago I started introducing my son to a wide variety of foods. One being these baby approved beef meatballs. Most meatballs have lots of filler in them. Not these. I use lean ground beef, shredded spinach and minced up match stick carrots combined with a little garlic powder and cooked mashed sweet potatoes! All good nutritious ingredients that my son loves. I use this small OXO cookie scoop to scoop the meat and make perfectly round bite-size pieces. I place them on a cookie tray and bake them for 12-15 minutes until they are cooked through. Internal temperature reaching 165 degrees Fahrenheit. He gobbles these meatballs up. Usually eating 3-4 in one sitting. They freeze well too making this an ideal quick dinner to heat up for baby. I can ideally get 24 mini meatballs from 1 batch. You’ll notice I’m only using 1/3lb. of lean ground beef. I usually use the rest for a dinner for my husband and I.
I took this photo last month of Ryder enjoying the beef meatballs. And in boy fashion… he then proceeded to show me the beef meatballs mid-chew! He thinks he is funny. 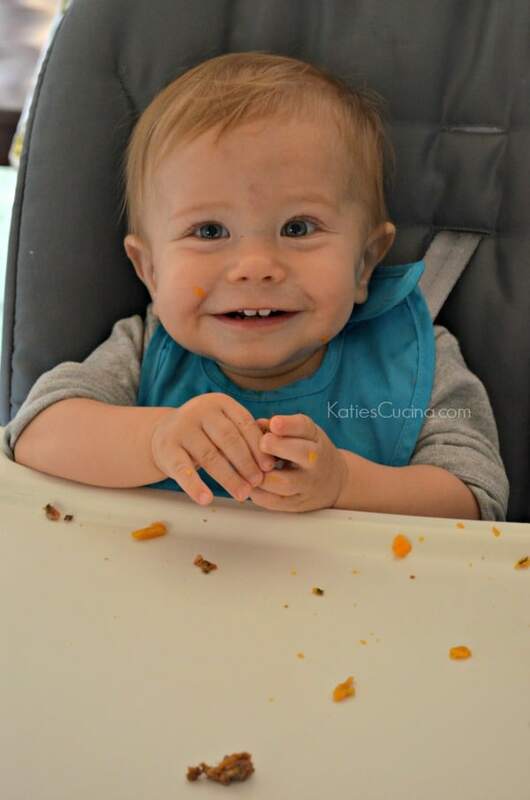 By the way if your looking for a highchair I highly recommend the OXO Seedling Highchair (and the roll bib). They are both a lifesaver and so easy to clean! Ryder is already spoiled and has enjoyed these fresh so often that he normally doesn’t care for the frozen version. He has to be really hungry. I’ve had them both fresh and frozen and I think they are both fine, but somehow this little stinker can tell the difference. I’ve already created a foodie monster. I’m in big trouble. 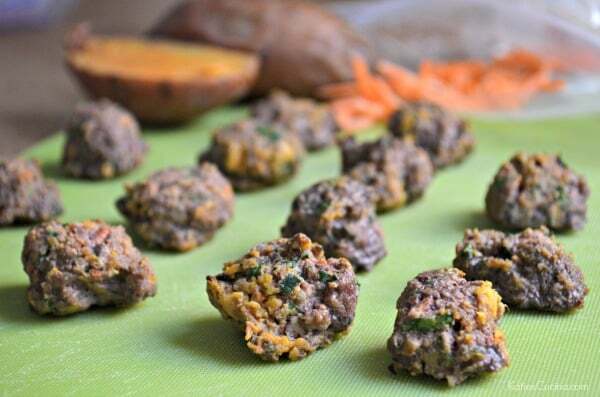 So if you have a baby and a picky eater I would highly suggest giving these meatballs a try. 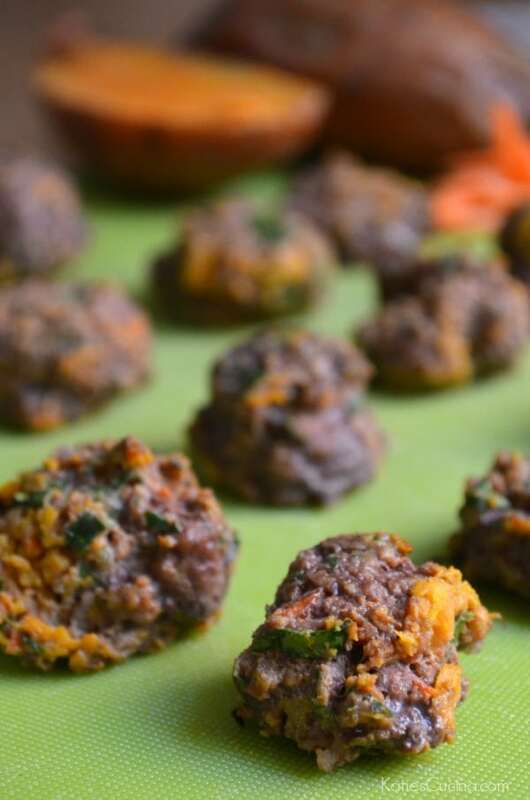 They are packed with veggies and your baby will never know it! 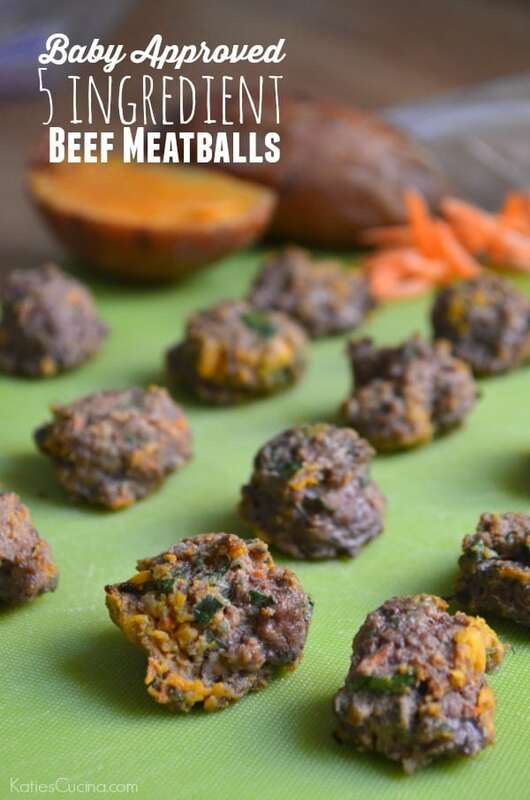 In a bowl, mix together the lean organic ground beef, fresh spinach, minced carrots, smashed sweet potato and garlic powder. Using a small OXO cookie scoop, begin scooping the raw meat and place on a cookie sheet. Bake for 12-15 minutes until internal temperature reads 165 degrees Fahrenheit. Consume within 5 days or freeze and eat within 3 months. SO CUTE! Pinning these for when I have kiddos! This recipe is kind of perfect for me tonight. I was looking for mini meatball recipes to try and I have a 1/4 lb of leftover ground beef in my freezer. I was worried I’d have to convert a recipe down. Can’t wait to try these out on my little one! I tried making these, following the directions, but they did not come out well. First of all, I doubled the recipe and used the Oxo cookie scoop and only got 14 small meatballs. How tiny are they supposed to be if you’re getting 24 out of half of that?!? Maybe because mine were larger than extremely tiny, they took longer to cook – I tried 15 minutes, but the internal temp was not high enough, so I added 5, and then another 3, and then another 3, and then finally just called it quits. I tried cutting one in half and it looks cooked through – actually seems a bit tough. It’s nice to pack it with meat and veggies, but I think meatballs may need a little of the filler for the right texture. Hopefully my baby will like them anyway, but I will look for a different recipe next time. Hi Emily, I’m sorry to hear this. I always recommend trying the recipe exactly how it is written on the first try–then modify from their. I used the small OXO cookie scoop (they come in three sizes–small, medium, and large). I didn’t add any additional meat to the scoop ensuring they would be bite-size and tiny. Oooh! My son is allergic / intolerant to so very much but these I can make (minus the carrots and garlic). In the post you said 1/3 lb beef and in the recipe, you have 1/4 lb listed. Just a heads up. 🙂 Will report back later today! Erin–hope he likes them as much as my kids do! Thanks for the heads up–I’ll adjust now! Hey Katie! Mine came out too hard and I was afraid my baby may gag on them if they’re too hard to chew so I scrapped them. Did I cook them too long in the oven? Any idea for how to soften them? Hi Stella, you might have cooked them a little too long. Mine never came out crispy. Every oven varies as far as temperature and time. I also find every baby is different. I would always break up the meatballs into small pieces for my son to feed himself. I’m sorry–this recipe didn’t work for you the first time around.